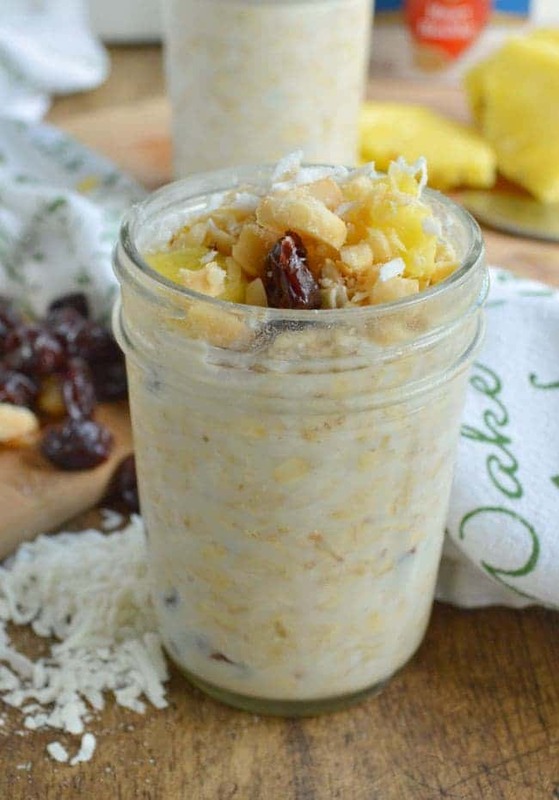 Made with shredded coconut, dried cherries, fresh pineapple, and chopped macadamia nuts, this Hawaiian Overnight Oats recipe will be your new favorite grab-n-go breakfast. 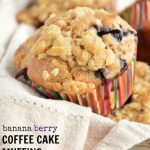 Perfect for busy mornings when you need to grab something good and go! This post has been sponsored by The Quaker Oats Company. All opinions, the original recipe, and photos are my own. We love oats! Let’s talk breakfast. Something you should know about me: I am a morning person. Like annoyingly so. I used to have a job that I had to report to at 5:45 a.m., six days a week, and I always did so with a smile on my face. People around me would drag their feet, load up on energy drinks, and avoid conversation for hours, while I raced around crossing things off my list and sipping coffee. In retrospect those people probably super hated me. But I can’t help it. I am most productive before 10 a.m. Mornings around here are pretty busy, but probably not more than most households — especially since school has started. I like to walk the dogs before the sun comes up, 1. to knock that out, and 2. because we live in North Carolina and even in September we are melting after noon. I pack all the lunches, start laundry, check email, make a grocery list, and shoo my boys out to the car so I can drive them to school. I usually hit the grocery store on my way back to the house. I spend way too much time at the grocery store. [ #jobhazard ] Anyway. All of this is before 8 a.m. If I’m not careful, breakfast gets lost in the mix. Which is totally unacceptable because I love breakfast! It is actually my most favorite meal. Lingering over a hot bowl of maple and brown sugar oatmeal is perfect on a wintery Saturday morning. 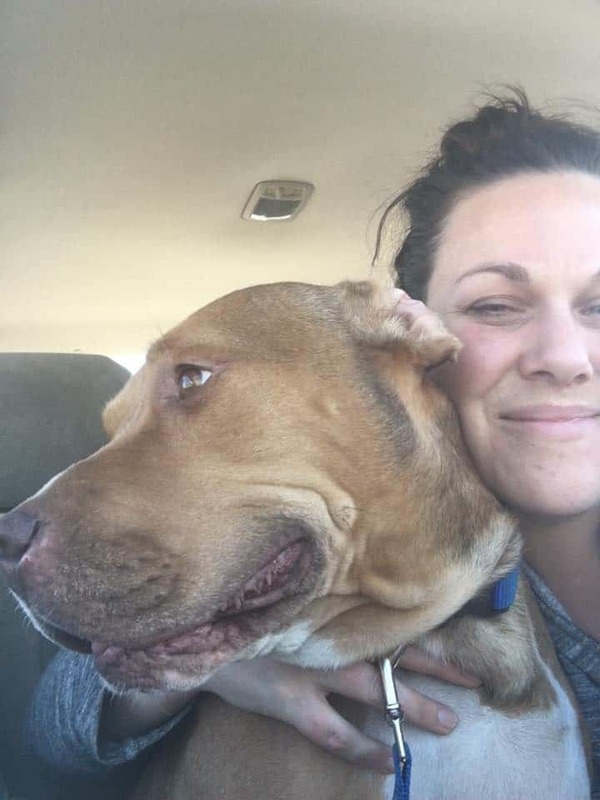 But during the week when I’m hot and sweaty from walking 4 dogs, and I still have 2,000 things left to do before I have to jump in the car, I want cold breakfast. Overnight oats seemed like a viable solution. 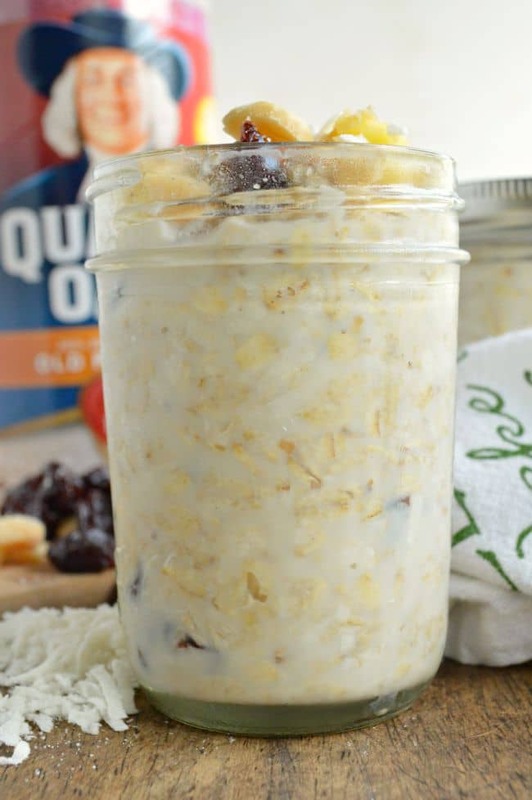 So I started playing around with flavors and landed on this: HAWAIIAN Overnight Oats. Okay. So let’s back up for a second. Because I need to tell you that in addition to being an annoying morning person, I am weird about texture and the temperature of my food. For this reason I am probably the last human on earth to try an overnight oats recipe. I was worried about the texture being soggy. And the temperature being wrong. I spent an unreasonable time worrying about this overnight oats recipe, you guys. HOWEVER. I made it, got it right on the first try, and have had it for breakfast 4 days in a row. That pretty much feels like overnight oat success. I started with a 1:1 milk:oats ratio. Stirred in some shredded sweetened coconut, and added just a tiny dash of brown sugar. You could totally skip the brown sugar, but I am pretty die hard for brown sugar in my oatmeal. It’s my favorite since forever. Anyway. If you are trying to cut out any unnecessary sugars, you could definitely go with unsweetened coconut. Or toasted coconut! Yeahhhh. I stirred in dried cherries, which, what is my obsession with cherries this year? I feel like I don’t even know myself. But the cherries are a must. Do it. Stir it all together, divide it between a few little pint jars, seal ’em up, and stick them in the fridge. It seriously took me less than 5 minutes. 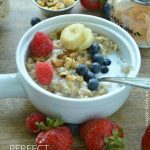 In the morning, after the milk and the refrigerator have worked their magic, the texture of the oats are cool and creamy. Think like … rice pudding. I didn’t think I’d be into it, but I am!!! Especially after I added fresh chopped pineapple and macadamia nuts. the nuts give the whole breakfast some crunch, sort of like when you add granola to your yogurt. It’s preeeeetty great. The pineapple has a little bite to it, too. The cherries soften a little when they soak, so they actually seem to pack more flavor than usual, if that’s even possible. Breakfast on the go! 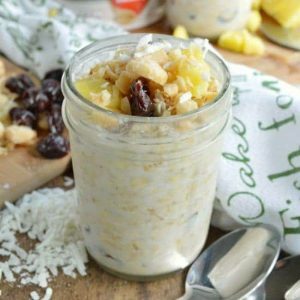 Old fashioned oats are soaked in low fat milk with shredded coconut and dried cherries overnight. 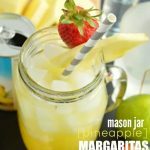 Topped with fresh pineapple and chopped macadamia nuts, this easy recipe will fast become a new favorite! 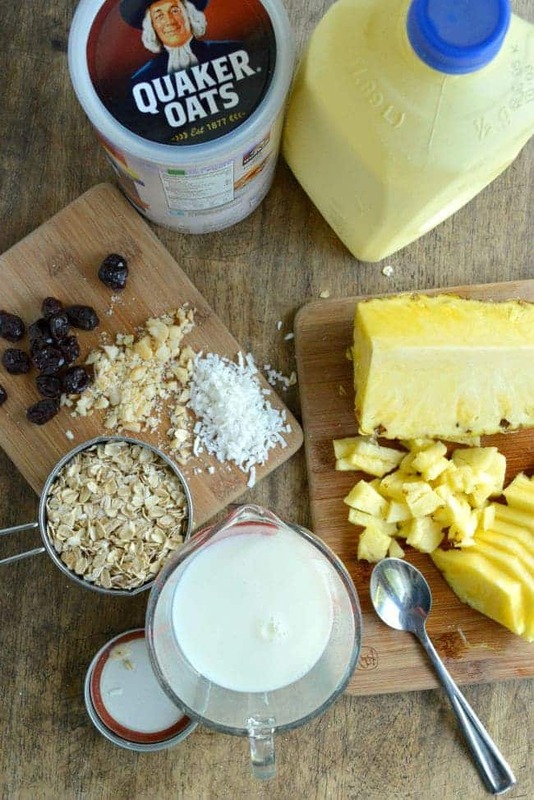 In a large bowl, stir together the oats, low fat milk, coconut, brown sugar, and dried cherries. Divide the mixture between 2 pint jars with lids. Cover and refrigerate for 6-8 hours, or overnight. 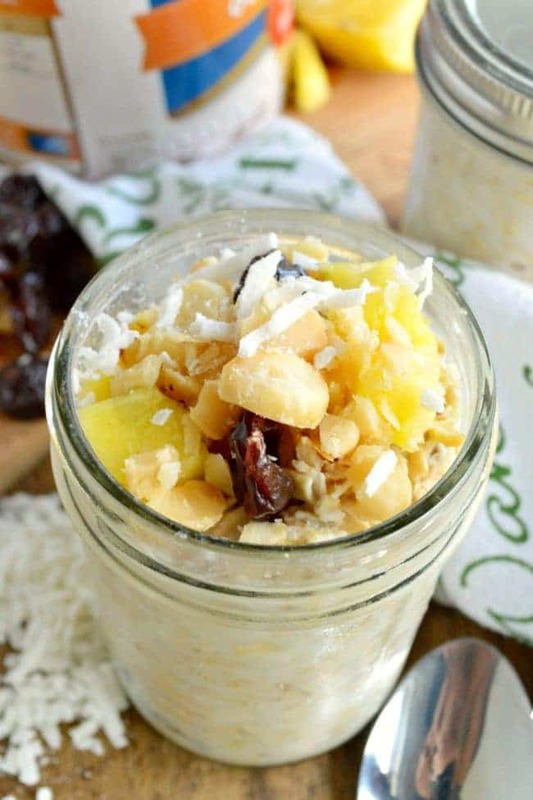 To serve, stir the oats and top each jar with the chopped pineapple and macadamia nuts. 1. You can use unsweetened shredded coconut or toasted coconut if you'd like to cut the sugar. I’m going to try it !! You addressed all my concerns … I always feel a bit squeamish about the idea of something soaking overnight … um … ick. And then to eat oatmeal cold. But you seem to have that same issues and you like it !! You convinced me. Thanks ! Thanks Pam!! I hope you love them. I definitely shared your worries. These did the trick for me! 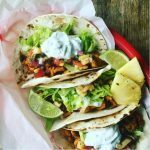 Could you heat this up a bit in the morning?